My very first try to wear Circle Lenses and I love it!!! After a extensive search for a eliable supplier, I ended up on the website of Honeycolour. According to a thread on gaiaonline.com many of the custumers are satisfied with the delivery of Honeycolour (it got 3-stars). There you find also lots of useful information about Circle Lenses as well as a black list of lens suppliers. A closer look may be worth it! the lenses look so nice! I love Princess Mimi on you – actually, all of them look natural on you. You should try green next time! Or pink for a super cute look. I think too, that it is an advantage for “lens wearers” – I went through all kind of problems like irritations, uncomfortable feelings, streaming eyes etc… In the meantime I got (more or less) used to it. 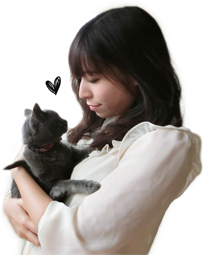 long no blog entry from Miho-chan T.T Is everything ok? Awesome blog! How did you get that layout?